Craving a mushroom and Swiss burger? 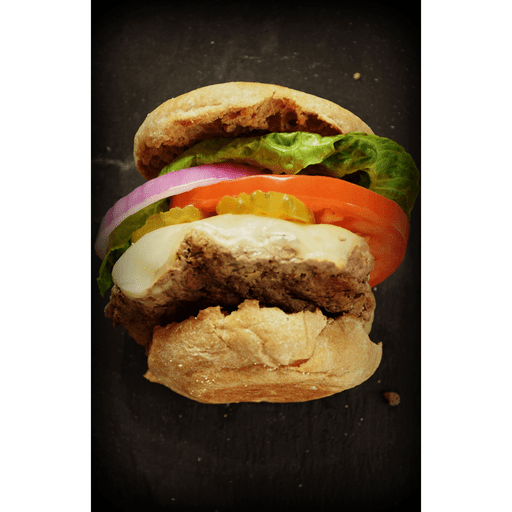 Get more of that umami, mushroom goodness with this mouth-watering blend burger. Finely chopped mushrooms mixed right in with lean ground sirloin, results in rich savory flavors (and veggies) with every bite! 1. Pulse the mushrooms in a food processor until finely chopped. Transfer to a medium bowl and add beef, garlic, soy sauce, ¼ tsp. salt and a few grinds of pepper and mix with your hands until combined. Form into four ½-inch thick patties. 1. Heat 1 Tbsp. vegetable oil in a large nonstick skillet over medium-high heat. Add the patties, season with salt and cook until browned, about 3 minutes per side for medium rare. Top each burger with a slice of Swiss cheese, cover and cook until the cheese melts, about 1 more minute. Remove from the heat and uncover. 1. Toast the English muffins, then sandwich with the burgers and toppings. Top with lettuce, red onion and pickles. For gluten free: Use tamari in place of soy sauce. Use gluten free hamburger buns in place of English muffins. Calories 350, Total Fat 13g (Saturated 4.5g, Trans 0g), Cholesterol 70mg, Sodium 510mg, Total Carbohydrate 30g (Dietary Fiber 5g, Sugars 6g), Protein 32g, Vitamin A 4%, Vitamin C 0%, Calcium 45%, Iron 20% *Nutritional values are an approximation. Actual nutritional values may vary due to preparation techniques, variations related to suppliers, regional and seasonal differences, or rounding.